Being born and raised in Chicago (but living in New England the last 15 years), my mind often wanders back to the many wonderful walks I took while living in the city. As an art historian, I was fascinated with the architecture, not only of downtown, but of the neighborhoods. Wandering the side streets of Chicago’s neighborhoods reveals a rich architectural history. I used to love walking around at night in my neighborhood (Wicker Park) and look at all of the grand old turn of the (20th) century mansions and see how people had renovated/updated them. Apparently, though, no period in art history is immune from “updating” existing buildings. Chicago experienced a boom in architecture during the 1920s because of the artificially raging stock market (sort of like today). One aspect of that boom was the “updating” of buildings that had either fallen into disrepair or had been abandoned because families had dissolved. A similar “modernization” occurred in American interior design and architecture during the 1950s, ironically affecting the work done in the 1920s! Sol Kogen and Edgar Miller met and both studied briefly at the School of the Art Institute of Chicago in 1917. They both quit and Kogen subsequently went to Paris, where he mingled with the avant-garde artists of the time, including Pablo Picasso. 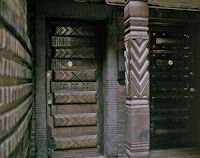 While there, he was impressed the way old buildings were renovated to not only accommodate modern taste, but also fill the need for (relatively) cheap artist space. 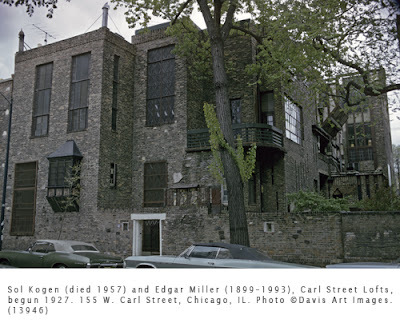 Kogen bought a Victorian mansion and he and Miller reconfigured it into artists’ spaces. Miller is credited with most of the design work as well as the interior design. They erected a brick wall over the existing mansion, took out the windows and put in stained glass and lead glass windows. 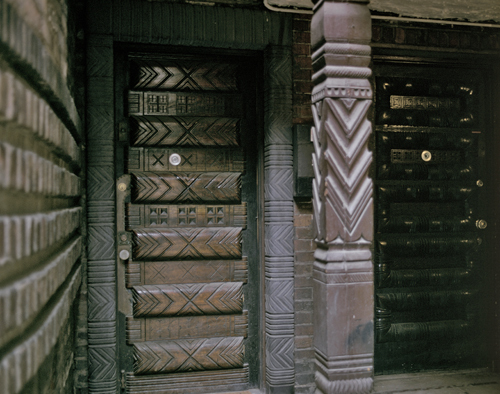 They scoured Chicago for architectural remnants such as mosaics, carved lintels, fireplace mantles, etc, and made each apartment unique. The design is not only a tribute to Art Deco aesthetics, but also the aesthetics of Bauhaus (in Germany) that espoused combining art with everyday design. The place is still a landmark, and, ironically, for sale. I visited it in the 1980s and was completely wowed by the combination of mosaic, leaded glass, angled walls, and just plain being so close to downtown (it’s in the Old Town area).